Hide. Run or Fight. Measures when Terrorists Strike ! In the event of a terrorist attack, Kenyans are required to do three things: hide , run away or fight the attackers. That was the message from Major Noah Bett, from National Counter Terrorism Center during the Senate Sensitization on Counter Terrorism at the Central Catering Unit, on April, 25, 2019. The University of Nairobi received an award at the 2nd edition of National Diversity and Inclusion Awards & Recognition (DIAR) 2019 Gala Dinner and Awards Ceremony in the ‘Inclusive Universities’ category. University of Nairobi AIESEC students are marking the 2019 AIESEC Week where they are engaging various industry players on issues ranging from solving societal challenges to offering solutions to SDG goals. The event runs from April 24-26, 2019 at the University of Nairobi Towers. 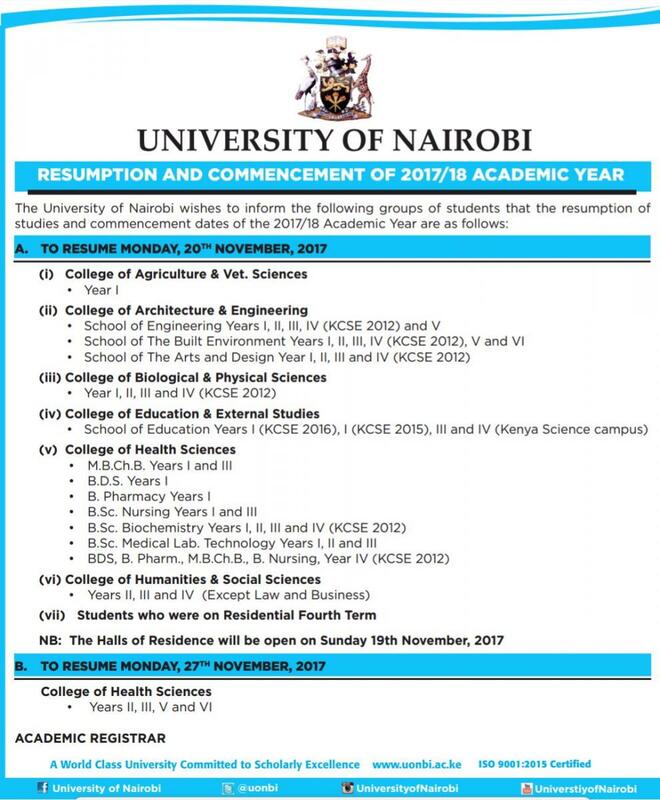 The University of Nairobi Vice Chancellor Prof. Peter Mbithi engaged the University Senate, on various issues affecting students. The sensitization workshop was held at the Central Catering Unit from April 18-19, 2019. The Ashinaga Africa Initiative mission is to contribute to Sub-Saharan Africa’s expanding role in global development through increasing access to higher education abroad. We support orphaned students who are committed to returning home and initiating change by providing access to full financial support to study at university abroad (equivalent to undergraduate degree), including tuition, room, travel cost and other necessary fees. Following a meeting of the Board of Trustees of the Gandhi Smarak Nidhi Fund; held on Friday, October 6, 2017, the applicants whose names are listed below, were awarded the Gandhi Smarak Nidhi Fund Scholarship for the 2017/2018 academic year. The Japan Information & Culture Centre invites you to the screening of the movie “The Garden of Words” which will be shown on Saturday, October 14, 2017.